California Crisis: Tsuigeki no Juuka (California Crisis: Gun Salvo), directed by Mizuho Nishikubo. 45 minutes. July 21, 1986. California Crisis is one of the early OAVs made by Hiromasa Shibazaki’s short-lived Hiro Media Associates. I’ve written before about how Shibazaki urged me to promote his OAVs like Bavi Stock and Fandora among the American anime fans of 1986, as an opportunity to get first-generation Japanese animation instead of the poor-quality 4th- or 5th-generation video copies that were the best that American fans usually could obtain – but the poor quality of most Hiro Media OAVs, plus their being priced at about $100 each (standard at the time for Japanese VHS cassettes, which were intended for sale to video-rental stores rather than to individual consumers), with pricey airmail shipping to America on top of that, meant that sales to American anime fans was very small. California Crisis was one of the first Hiro Media OAVs, when Shibazaki had the most money to spend in its production and promotion. 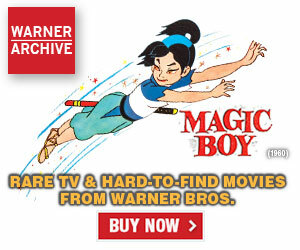 It was produced by Studio Unicorn, a tiny anime studio that almost immediately went out of business. Shibazaki advertised it heavily, mostly in his own new monthly anime magazine, Globian, which existed to showcase the Hiro Media Associates titles. Globian existed for less than a year. California Crisis seemed to have only one publicity image. It appeared on the OAV cover, on a Globian cover on the issue that cover-featured it, and probably in every advertisement for the California Crisis video. That image, and the entire OAV, featured the over-solarized art style most commonly associated with the commercial artist Patrick Nagel, who was very “in” at the time. California Crisis was immediately forgettable. The story went nowhere, because it was originally intended to be the first half of a two-part story (Shibazaki told me this. Anyone getting the OAV was left hanging by its cliffhanger ending.). 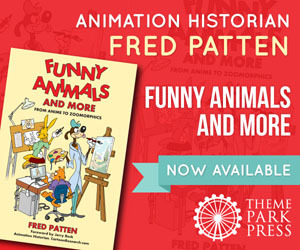 Animation fans at the time said, only half-humorously, that it looked like the main purpose of the video was for a handful of Japanese animators to come to California and take a road trip from San Diego to Los Angeles for location shots. Noera is a young blond California beach bum drinking with his old school friend Leroy at a bar in San Diego, Café Border Line. They reminisce about how life has changed for them since they graduated from high school ten years ago. Noera (who admits he’s drunk) begins the drive to Los Angeles in his new red Cadillac convertible for a new job. Noera, Marsha, and one of the Air Force trailers are forced off a steep cliff high enough that Noera and Marsha, and Noera’s red convertible, shouldn’t be so unhurt. (And where is there a steep cliff on the highway from San Diego to Los Angeles?) Marsha’s motorcycle is totaled, so she joins Noera under gunfire. She also picks up a Persian cat, later named Fumia. At a coffee shop, Marsha shows that she’s retrieved a metal box from the crashed Air Force trailer that contains a bowling-ball-sized ball that gives her and Noera a vision of Death Valley. She somehow associates this with “American Dream” and immediately wants to go there. “Haven’t you seen Close Encounters of the Third Kind! ?” Noera says to leave it to the police. Three carloads of uniformed men enter the diner and start shooting at them. They escape by jumping through a picture window. This apparently doesn’t get any attention from the other diners or coffee-house staff. Noera and Marsha flee in the red convertible, pursued by the three Dodges full of Kremlin spies shooting at them. Cars, motorcycles, trucks, a Greyhound bus, and five California Highway Patrol cars are wrecked. This still doesn’t draw any civilian attention, even though the Air Force classifies it as Top Secret. The three Dodges somehow turn into two vans. Marsha thinks it’s “fun”. They arrive in L.A. at night, and are immediately chased by the Kremlin spies shooting at them. (I assure you that if there was a running gunfight through the Hollywood area of L.A., someone would take note of it.) Whenever the Kremlin spies are about to catch them, Fumia claws them off. Noera and Marsha elude them by slipping into a rock/dance club where, by a really amazing coincidence, they run into Jack Varo, an old school chum of Noera’s who has become an Air Force sergeant who is part of the Top Secret manhunt for them. (Never mind what Jack is doing dancing at the club.) Jack is later seen in a helicopter searching for the Space Ball, or “Space Mind”. He and his squadmate complain they don’t know what’s going on; Captain Kain won’t tell anyone anything. Noera and Marsha buy a used truck to go to Death Valley. They pass Edwards AFB, where Captain Kain joins the chase after them (shooting, of course). After a crash, Kain offers to buy the Space Mind for $10,000, but they aren’t selling. Kain tries to steal it, but Fumia claws him unconscious. Noera and Marsha race towards Death Valley with Edwards AFB’s helicopter gunships shooting after them. They try to escape the gunships by driving into narrow canyons, but they fall into a deep river. They are about to drown, but the Space Mind saves them – somehow. But it is broken and turns transparent. California Crisis ends on this cliffhanger. Hiromasa Shibazaki told me there was to be a conclusion in a Part 2, but it was never made. Most fans didn’t care enough about this to miss the Part 2. San Diego, Orange County, and Los Angeles/Hollywood may show a lot of location shots, but it’s obvious that none of the production team went anywhere near Death Valley. Actually, Noera’s car was a Chrysler 300, not a Cadillac. San Diego, Orange County, and Los Angeles/Hollywood may show a lot of location shots, but it’s obvious that none of the production team went anywhere near Death Valley. Obviously not enough time on their trip for that I’m sure. I just recently saw this OVA and I was surprised by it in a very good way. California Crisis has become a favorite of mine. 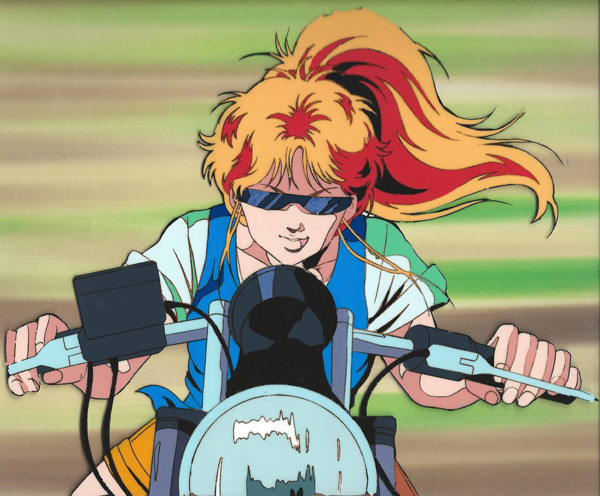 I think this is a wonderful example of 1980s Japanese OVA industry style over substance cliché. Nevertheless, I’m actually quite fond of this type of style, very unique and distinctive, giving the animation its own identity with the visual Art Deco-like presentation. Given what Patten commented about originally being planned as a two-part story, I cannot fault it for lacking a proper conclusion. 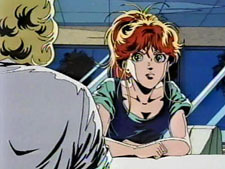 Whoever knows about the 1980s and sees this anime will immediately recognize that unique 1980s feeling. I do like when anime depict real brands. It’s been a long time since I saw Coca-Cola in any type of animation and the brand is certainly synonymous with American popular culture. I would’ve liked to see McDonald’s or Carl’s Jr. instead of a generic hamburgers sign when Noera and Marsha are eating. After all, they show a Hard Rock Cafe, so why not something similar for the hamburgers? I couldn’t identify the beer that Noera was drinking. Does anyone know if it was a real brand? Also, what was the brand of whisky at the beginning? The premise was interesting for me. I kind of see it as an equivalent to racing arcade video games in comparison to simulation racing video games, in the sense that it’s the simplicity that gives the fun to the first ones. 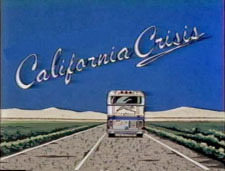 In the case of California Crisis, it’s a simple chase story with no complications, where the presentation is more important than the finer plot details. I truly wish that it had succeeded as I did enjoy this approach, which mimicked 1980s American action films. Incidentally, I’ve seen that many reviewers draw comparison of this anime with the 1985 video game Road Blaster / Road Avenger. I do see it as having a similar relationship to car chases in video games as what Mellowlink is to boss fights in video games. Also, the vocal songs, performed by Miho Fujiwara of the Japanese band Chocolate Lips, stand apart by themselves. Very good examples of Japanese funk music. I’d say in general it has one of the best obscure OSTs for an OVA. 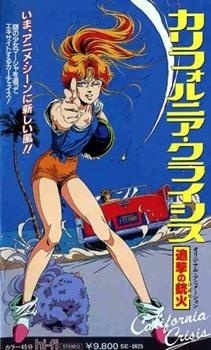 I grew up in 1980’s California, and this anime dead on captures the feeling of southern California. The girl, Marsha, seems very idealized and what Japanese people of the time must have thought crazy American girls must be like, and does not feel American at all. But I was totally taken in by the heavy animation style and good chase scenes. It’s worth a watch just for that.